Rest In Peace, Fort Worth Jazz Pioneer Ornette Coleman. As happens once in a great moon, cracking the top of our weekly, local music power rankings isn't cause for celebration. This morning, legendary free jazz innovator Ornette Coleman passed away in Manhattan at the age of 85. There has probably never been a more influential saxophonist than Coleman, and the Fort Worth native will likely forever be remembered as one of North Texas' greatest musical exports. 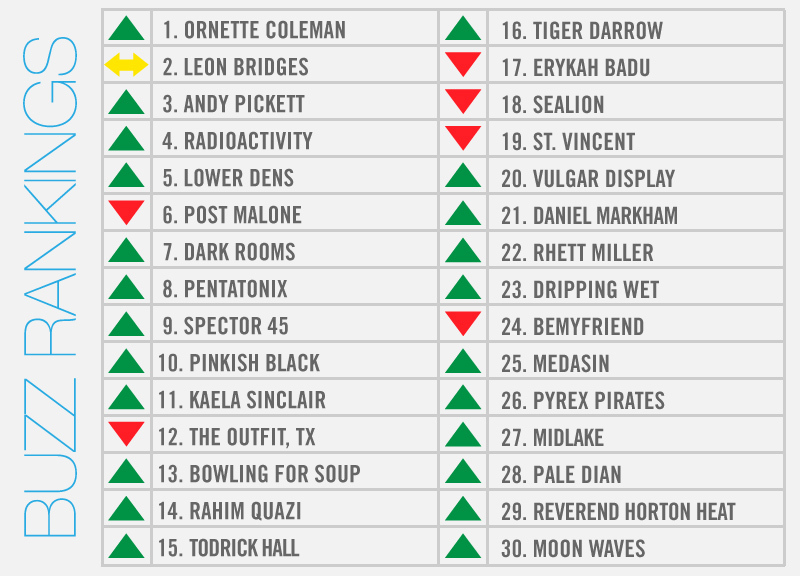 Somewhat fittingly, the next two spots in this weekend's rankings are currently carrying on Fort Worth's music tradition. In the No. 2 hole is the perennially-buzzing Leon Bridges, who released a new music video this week leading up to the release of his major label debut. And releasing a debut album of his own this weekend is relative newcomer Andy Pickett, who'll celebrate with a show at The Chat Room this week that'll find him backed by a live band for the first time. Other shows this weekend to watch out for include a solo set from Rhett Miller at Fort Worth's Shipping & Receiving, plus Reverend Horton Heat and Cody Jinks, who'll play at House of Blues on consecutive nights. Also this past week, Pinkish Back opened for The Mountain Goats, Daniel Markham opened for Christopher Owens and Sealion opened for Diarrhea Planet. Elsewhere: Lower Dens covered Hall & Oates; Blackstone Rangers changed its name to Pale Dian; and Dripping Wet released a new EP.